So you own an awesome looking iPhone or an iPad, a cool device that does almost anything you expect it to do. But then, just when you are enjoying the moments, just when you need the device to capture something unforgettable, it shuts down with no power outlet close to you. Well, imagine how frustrating that is. What you need are iPhone battery packs! The following are the top 5 iPhone battery Packs that save the day and those unforgettable moments of our lives! If there is a possibility that you could experience a power outage for a number of days, then you need not fret over how to keep your iPhone 7 powered. 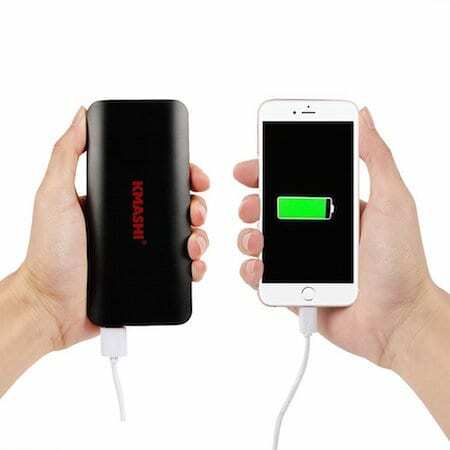 All you have to do is to reach for the RAVPower Ace battery bank .This particular brand of battery bank comes with a power rating of 22,000 mAh; enough to charge your iPhone at least six times, if not more. The RAVPower Ace power banks are relatively compact with dimensions measuring 6.5 inches long, 3 inches wide. And they’re about an inch thick, making this particular battery bank portable and convenient to use. The casing of the battery bank is a UL94 V-0 fire-resistant shell. The same material used by top car makers Mercedes and BMW for parts of their vehicles. This fire-resistant casing prevents fire outbreaks when the bank has to charge from an electric outlet. The RAVPower Ace battery bank also features three ports. So users charge up to three devices concurrently. A unit of this particular battery bank comprises the RAVPower Ace Series 22,000 mAh External Battery Pack, Micro-USB Charging Cables (X2), a Carry Pouch, User Guide and a Lifetime Warranty Card. If you want a power bank that’s about the size of a chocolate bar, but you still need to charge your iPhone a couple of times with it, KMASHI’s 10,000 mAh banks fits that bill. 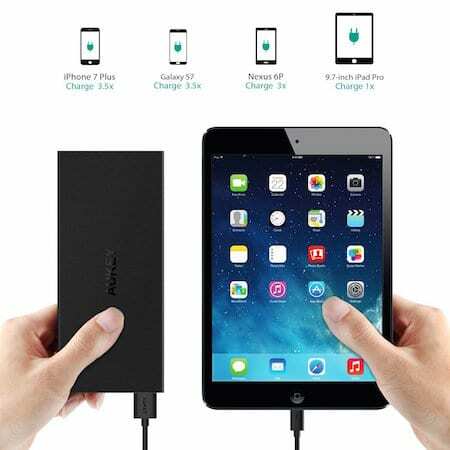 KMASHI delivers a super-fast charge output through dual USB ports (5V / 2.1A and 5V / 1A) that allow for the simultaneous charging of your iPad, iPhone, and other devices at high speeds. 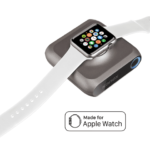 The Input at 5V/ 2A gives about 6.5 hours fast-charging. KMASHI is a smart device in its own right. 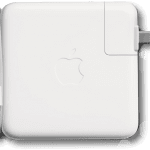 It features an intelligent power management system which delivers over-current, over-charge, and over-voltage protection. 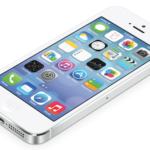 This ensures that your iPhone, as well as your battery bank, does not suffer damage in case something goes wrong. The KMASHI battery bank is fitted with LED indicators that let you know when the bank is fully charged and when it’s time to recharge. So you’ll know roughly how long you have before you need to plug the power bank in. The KMASHI battery bank comes with a 10,000 mAh 2A input Fast Charger External Battery, 1 Micro USB charger cable (iPhone/Samsung Galaxy S5 Note 3 cables are not included) and a user manual. YOU CHARGE ON THE GO. You never have to stop for an outlet again! When your iPhones battery levels begin to drop, all you have to do is pull your Crave PowerPack battery charger out of your bag and recharge your device(s). IT’S COMPACT & PORTABLE: The Crave external battery charger fits conveniently in your bag, suitcase or purse. Weighing less than 1.5 kilograms, this battery bank goes wherever you go and never runs out of power. BLAZING CHARGE-TIME: With a power capacity of 50,000 mAh, the Crave PowerPack charges your devices quickly and efficiently. When fully charged, each Crave PowerPack charges your iDevice from zero to hundred percent, for up to 15 charging cycles. AN 18-MONTH WARRANTY: The Crave portable charger comes with an 18-month warranty that covers the buyer in cases of faulty batteries, charging problems, and other internal issues. 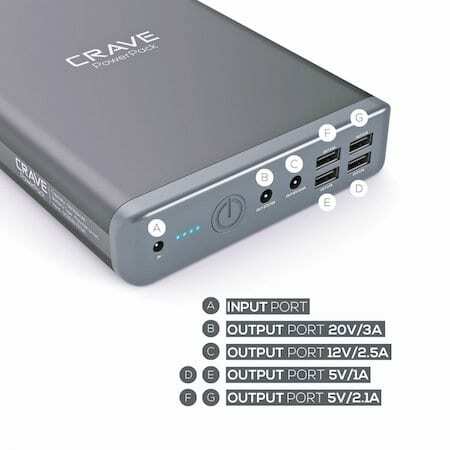 LAPTOP COMPATIBILITY: The Crave Power Pack also works perfectly with many laptop brands including Acer, Asus, Compaq, Dell, Fujitsu, HP, IBM, Lenovo, NEC, Samsung, Sony, and Toshiba. The Crave PowerPack is one of the more expensive battery packs out there, but it lasts longer and covers a much wider range of your electronics’ charging needs. For the nuanced battery bank user, the Aukey is on the larger side for a bank with a 16,000 mAh capacity battery. However, what it lacks in subtlety and compactness it makes up for in performance. You charge your iPhone 7 Plus over 3.5 times, the iPhone 7 and 6 models around 4 times, and even fully charge a 9.7-inch iPad Pro once. The Aukey battery bank features a built-in flashlight, which comes in handy when you want to plug your iPhone in the dark or when your iPhone is dead and you need a little light. 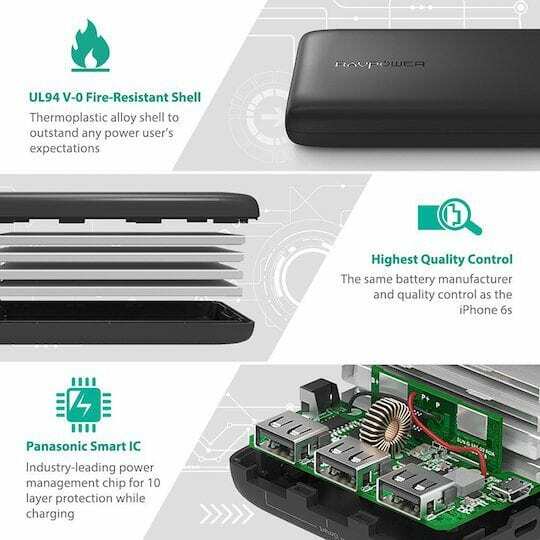 The Aukey battery bank has built-in safeguards to protect your iPhone from a power surge and overheating. And you get a 2-year warranty should anything go wrong with the bank. This particular battery bank comes with an AUKEY PB-T3 16,000 mAh Power Bank battery, a USB A to Micro-USB Cable (20cm) and one user manual. The Anker battery bank has a capacity that’s clocked at 20,100 mAh. And it is able to charge your iPhone six times. It weighs an impressive 12.5 oz. 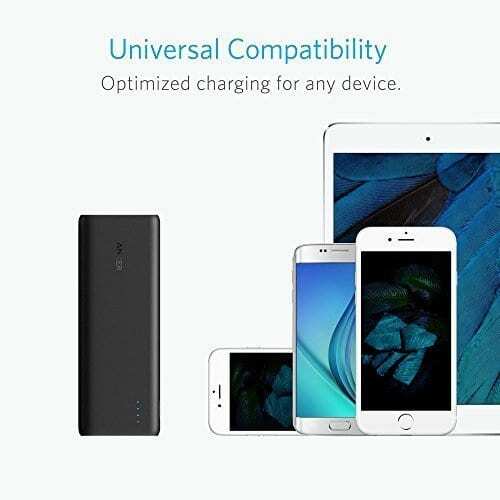 The Anker PowerCore battery bank delivers high-speed charging, combining PowerIQ and VoltageBoost to give the fastest possible charge. The Anker PowerCore battery bank recharges itself in 10 hours with a 2 amp charger. For the safety-conscious user, The Anker comes with a MultiProtect safety system that ensures complete protection for you and your devices in the event of an over-current, an over-charge or an over-voltage. An 18-month warranty covers each Anker product. This particular battery bank has dual USB ports, so you can charge two devices at the same time. A unit of the Anker PowerCore battery bank includes the Anker PowerCore 20100 Portable Charger, Micro USB cable, travel pouch and a welcome guide. iPhone battery packs literally save the day when access to power is a problem. Most iPhone battery packs are compact and light weight, so traveling with them is not an issue. And most feature power management systems that deliver over-current, over-charge, and over-voltage protection. 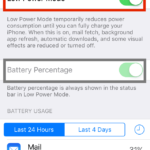 Power management ensures your iPhone is not damaged should there be an power surge or some other power event. Finally, all our reviewed models come with pretty generous warranties, just in case problems surface. If you are regularly having battery drainage issues with your iPhone or iPad after updating to iOS 10, Please take a look at our video below for some tips to help with the issue. Backup power packs are fast becoming an essential item on any millennial’s list of possessions. The iPhone 7 and other similar devices need safe and effective battery banks that deliver optimal charging. The choice of a battery bank is dependent on the specific needs of the user and such a choice will be influenced by factors such as the weight of the bank, its versatility, and performance as well as its cost.